What? No zodiac sign today? I hate to break it to you, boys and girls, but there’s more to astrology than the signs. In fact, planets are where it’s at. Signs are just butter on your bread, dressing on your salad, scallions on your sweet potato. Uranus is the planet of revolution, sudden change, and independence. 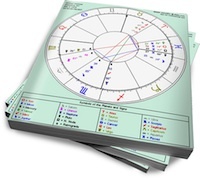 We all have this disruptive influence in our charts, and because this outer planet spends about seven years in a zodiac sign as it travels around the Earth (! ), its sign placement is not so important. Rather, its house placement shows where you need to shake up the status quo in your life. We all have twelve houses in our chart, the houses being a way to divide time and space. They relate to areas of our lives, and the Seventh House concerns marriage and other significant partnerships. The Seventh House is the “dusk” part of our chart. If the Sun were in your Seventh House, that means that our star was soon to set at the time of your birth. There’s about a 1-in-12 chance that anyone you meet has Uranus in their Seventh House. Woe be unto the poor soul who falls in love with such a person! The U7 (let’s call them), somewhat like someone with Venus in Aquarius, needs independence in his marriage or significant partnership. He won’t be tied down in any type of traditional relationship. U7 may be attracted to eccentric, brilliant or off-beat types as partners. Or he needs an unconventional arrangement — maybe an open marriage, or at least freedom from the constraints of being at his spouse’s side at all times. He may also feel that significant others are forcing change upon him, or that his spouse undergoes personal revolutions on a regular basis. Uranus in the Seventh is a more powerful placement than Venus in Aquarius. U7 must continually break down the rigid structures of partnership. He will be compelled to shake things up when they become stagnant. Hence, U7 is not the ideal man if you want anything resembling a stable partnership. This does not mean that you can’t maintain longevity — but to make it work, you have to be flexible enough to withstand periodic upheavals in your love life. I guarantee it won’t be boring, but if you can’t tolerate the relationship equivalent of the Storming of the Bastille, turn away now. Comment below: Do you have Uranus in the Seventh? How do you experience it? I have Uranus square Mars in my 7th house, plus Venus in Aquarius. Going through my second divorce, but was married 8 & 18 years respectively. Now in a new relationship, and I can’t seem to help creating a lot of drama. In the past I have just shut down. I feel dissatisfied easily in a relationship. Forgot to mention my guy has U7. Sometimes I think he’s really weird, but that’s what I love about him! I have Uranus (in my 7th house) square the sun. After 2 marriages, relationships which lasted 20 and 10 years I accept that I won’t make that legal commitment again, it simply doesnt make sense with who I am. The need to feel free seems to have been struggling to the forefront of my consciousness my whole life and it’s clear now. Partners who can accept my need for freedom and enjoy the same from me may be possible, but no more legal ties! im a girl with U7, and being in the relationship that im in now, i makes so much sense why i feel flighty. my boyfriend has even told me he’s afraid one day i’ll just leave him. im a very loyal person but i do feel a strong need for freedom and to do what i want. i hate restraints and being told what to do. & when we do the same thing a lot it does get boring and i feel very restless & stir crazy. U7 female here. I’ve been in relationships with males of very different personalities between one another. Or different family income levels. Perhaps, it is my Leo sun, cap moon and cancer Venus + Mars that reminds me of my emotional vulnerability hence I do not require so much personal freedom? U7 here as well as Neptune and Mars in H7… Sagittarius Dsc with Uranus square Jupiter. Have been unlucky in love… Always very independent. Never wanted kids til I met my ex at 21 (who looked nothing like I expected the man I would fall in love with to look like). I think wanting kids and marriage was due to Pluto transiting H7 at the time I met him. Interesting that the words numb is affiliated with Uranian energy… That exactly how I felt after he broke up with me and I’ve been single ever since (6 yrs) and feel like a completely different person. I am back to living the single life I loved before I ever got involved with anyone and no longer want marriage or to be tied down or controlled by anyone. I am very loyal but the older I get, the more obvious the Uranian and Sagittarian H7 energy is to me. I will not just enter a relationship for the sake of feeling secure in myself… It would need to be something pretty damn special to pin me down these days or even get my attention. Great article. 32 and not having a girlfriend,job but yet having a soul.Whatever U7 is present ,is a theme for a life where you have to be alone,to be on your feet.Basically you have been in many life where was some kind of unbalanced but stable(almost unchangeable) relationships.My chart would show i was dependable on relationships and my U7 in current life it’s hard to deal with. My very recent ex (tonight was the final straw) is a U7, and it’s impossible. No way to have stability or comfort. Way too much of a drama king for me! No, thank you. Appreciate what you wrote about it…I’m turning back now, just as you suggested. My husband of 15 years has both U7 (conjunct Pluto) and Venus in Aquarius…haha. He also has Sun/Mercury/AC all in Aquarius. My Moon in Aquarius conjuncts all his Aquarius and my Venus squares Uranus. I have to say that I want our marriage more unconventional than he does. His Moon and Mars in the 8th house means that he craves deep intense intimacy and loyalty from his partner and I have a hard time giving him that. But I also have the ability to heal his poor 8th house Moon heart which makes him just adore and crave my love. It’s quite a crazy romantic fairy tale. We really do both love it. We are always doing very crazy things in our relationship which would break most marriages….truly! But we feel triumphant over these things and that they only make us stronger.